As much as we dislike the term, phones like the Huawei Ascend Mate are the reason people say the word “phablet.” With a 6.1 inch display and high-midrange specs and performance, the Mate definitely bridges the gap between large phones and small tablets. While this type of device is popular among Android enthusiasts and gadget geeks, is the Ascend Mate enough to help Huawei break into a market currently dominated by Samsung and LG? Okay, probably not, but is this a phone worth buying? Read on to find out. In a hurry? Check out our video review, or jump to the conclusion at the end of the article. As large as the Huawei Ascend Mate is, it is surprisingly easy to hold and use, for a few different reasons. The first and most important is the grippy plastic used on the back of the device. It may not be the prettiest plastic we’ve ever seen, but it goes a long way toward ensuring that you don’t drop the Ascend Mate the first time you sneeze. This grip is also present on the sides of the device. The second reason is that, like the recently-reviewed Samsung Galaxy Mega 6.3, the bezel size is comparatively small. When it was announced, Huawei made a point of announcing that the screen-to-body ratio is 73%, which it claimed to be the highest in the industry. 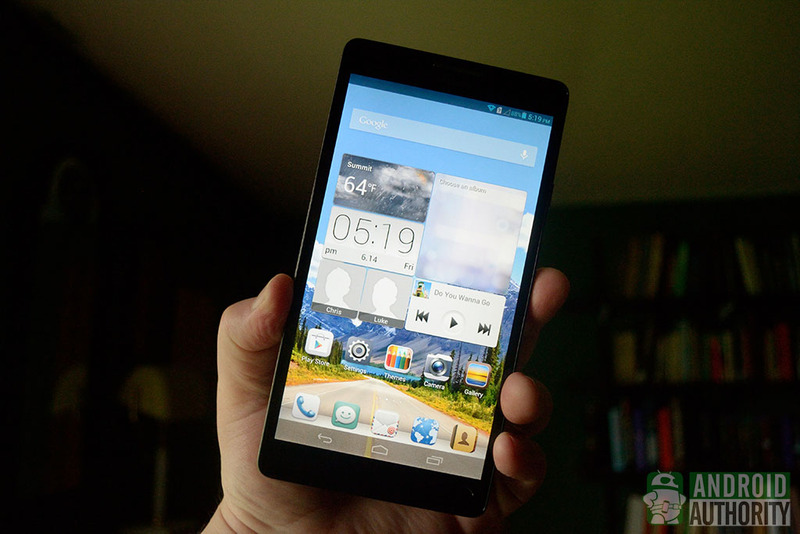 Basically, the Ascend Mate is a joy to hold and use, just don’t count on being able to put it in smaller pockets. Before we move on to the display, I’d like to touch on one thing I really liked about the Huawei Ascend Mate, as small as it may seem: the haptic feedback. This isn’t something people talk about very often, but well-implemented haptic feedback often does a lot to make a phone feel right, and Huawei has definitely accomplished this with the Mate’s solid, thuddy-feeling haptics. This is why you’re reading this, right? Sure, the Huawei Ascend Mate has plenty of other things about it to like, but the display is the main event. When we first got our hands on the Ascend Mate at CES 2013 our Editor-in-Chief and certifiable large phone fan Darcy Lacouvée was immediately smitten with both the display size and the massive battery, which we’ll touch on later in the review. Unfortunately, the display is only 720p. Yes, that was fine in 2011, and it’s still fine for plenty of smaller devices, but on a screen this size, it hurts. With 1280 x 720 stretched across a 6.1 inch screen, you end up with a pixel density of around 241 ppi. Pixels are definitely noticeable if go hunting for them, but luckily, most people aren’t that likely to have a device this size just a few inches from their eyeballs. Once you’re holding the Ascend Mate at a comfortable distance, the pixelation and slight lack of sharpness aren’t all that apparent. We’re dealing with an IPS+ display here, and the colors are well represented but not overly saturated. Brightness is good, and outside visibility was actually better than expected. Black levels are decent, and viewing angles are great. In an interesting addition, you can actually adjust the color temperature in the Display settings, which is great if you like to use the Ascend Mate at night without ruining your sleep quality. Look it up. When we test phones, we see a lot (and I mean a lot) of the usual suspects when it comes to hardware: Snapdragon, Exynos, Tegra and, well, that’s about it for the most part. Since Huawei makes their own processors, I was really interested to see how the Ascend Mate’s hardware would hold up as this is not the sort of thing that crosses my desk very often. First we turned to our benchmarking tool of choice: AnTuTu Benchmark. As always, we ran the benchmark 10 times, in different situations. Scores were much more consistent than we often see, ranging from 15,012 at the low end to 15,871 at the high end. Averaging the scores out, we ended up with a final score of 15,639. It’s worth noting that we tried running the benchmarks with the Power Manager set to both Normal mode and Optimum Performance mode, and saw no noticeable difference between the two. Next we turned to Epic Citadel. Though the app was recently updated to add a third graphics mode, only two were available on the Ascend Mate: High Quality and High Performance. This is likely due to the chipset’s older Cortex A9 architechture. First, we ran Epic Citadel’s Benchmarking mode with the graphics set to High Quality and saw an average framerate of 37.7 FPS. Next we tried High Performance and the framerate increased to an average of 40.2 FPS. Real world performance was definitely solid. Scrolling through the home screens and various menus always remained very fluid, and apps never failed to launch quickly. When it came to gaming, simpler games like The Jump ran without a hitch, but games that tax the hardware more, like Real Racing 3, had a little more trouble. 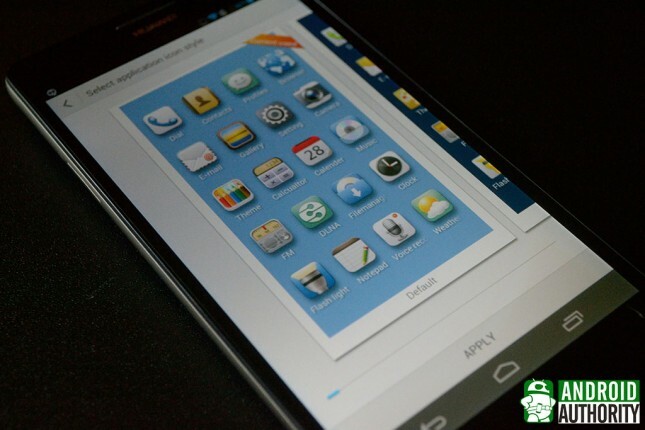 The Ascend Mate runs Android 4.1.2 Jelly Bean, skinned with Huawei’s Emotion UI. If you’ve never encountered this UI before, it will definitely take some getting used to. The lack of an app drawer definitely feels strange at first, all though you’ll likely get used to the idea of just having all your apps on your home screens within a day or two. Still, it was strange at first. On the plus side, the UI is immensely themeable. While HTC Sense and LG’s Optimus UI offer some customization options, Emotion goes a little nuts. Out of the box, there are 20 different official themes included, ranging from bright and colorful to monochromatic and muted. Now that’s fine if you’re the type who colors inside the lines. If you’re not, it’s very easy to select your own lock screen style, wallpaper (for both the home and lock screens), icons, font and different ringtones to create a theme of your own. When it comes to apps, there really isn’t much in the way of bloatware included, and the apps that are included lean toward the utilitarian: Flashlight, SIM Toolkit, Backup, App Installer, etc. Kingsoft Office is included and, unlike a lot of other preinstalled office suites, can actually create documents on the fly instead of simply opening or editing them. Facebook, Twitter and of course Google+ are included and, aside from the usual Google apps, that’s about it. The 8 MP rear-facing camera is fairly standard when it comes to features. In addition to its default Smart mode, you can also select HDR, Panorama and Burst modes if you want to get a little more creative with your photos. Normal mode gives you more control, allowing you to manually select ISO, white balance and exposure settings. Unfortunately, the images produced by the camera are decent, but nothing all that great. Smart mode allows you to easily focus by tapping on the screen, but as that that focal point moves away from the center, the images start to get more and more fuzzy. Low light performance isn’t great and, as is usually the case, the LED flash will help you get a photo you can see, but it won’t ever help anything look all that great. The 1080p video capture is smooth and produces generally good picture and sound quality. Of course, as you might expect, once you move into low-light situations, the quality suffers noticeably, with a large amount of visual noise present. Interestingly, the Huawei Ascend Mate features two microphones, so it captures stereo sound. This isn’t the sort of thing that will matter all that often, but it is still nice to have. With a 6.1 inch screen, you’re probably going to spend quite a bit of time looking at it, so luckily Huawei stocked the Ascend Mate with a huge 4,050 mAh battery. That battery is put to good use too. Basically, the day I took the Ascend Mate out of the box, I took a look at the battery capacity, which was at 80%, and decided to just start testing. After hours of benchmarking, gaming, testing the camera and just generally using the Mate as much as I could, the battery life was down to 20%. Not bad. Even better, the charger that tags along in the box with the Ascend Mate supports fast charging, so you’ll be back up to 100% much more quickly than using a standard charger or, worse, a USB port. Unless you enjoy letting videos loop in your pocket while you walk around, you can be pretty certain that the Ascend Mate is going to last you through a whole day, no matter how much you use it. Which is nice, because you’re stuck with the stock battery. Despite a few issues here and there, like the okay buy not great camera and the slightly dated chipset architecture, there is an awful lot to like about the Huawei Ascend Mate. Whether the simplified, somewhat unusual UI appeals to you is up in the air, but if you like the idea of a large screen on your phone, you could certainly do worse, especially if you don’t mind 720p. 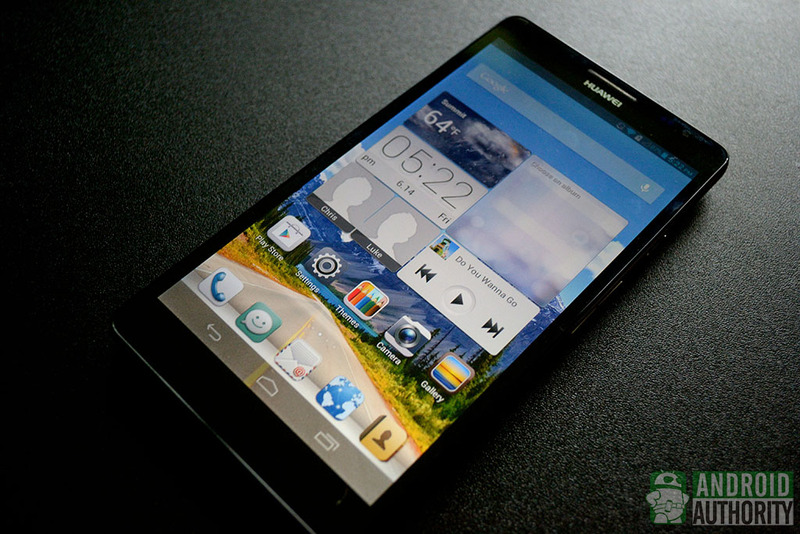 What do you think of the Huawei Ascend Mate? Have any questions? Let us know down in the comments!